The following family tree includes the known ancestors and descendants of JOHN GOFFE, one of the earliest settlers of Manchester NH and surrounding towns. There were several generations, all bearing the name of JOHN so read carefully. This is NOT meant to be a comprehensive genealogy of ALL GOFFE or GOFF lines in the United States. I have included all the information I have knowledge of, along with sources (at the bottom). Please do not contact me, asking if I would research your GOFFE line. If your line is not here, then I am not aware of it!! I have done my best to verify the information below, however, I do NOT claim that it is 100% accurate (in other words, use at your own risk, and verify this yourself). This was compiled during many hours of person research, and may NOT be used in a book or electronic publication that is for SALE or RESALE. Doing so violates copyright law. This information is FREE to descendants/relatives who are using it for their own personal knowledge. All of the information contained in this document is found in the public domain. [Webmaster's note: There is much discussion regarding the origin of John-1 GOFFE below. Since I could not find any definitive proof of his ancestry, it is not included here]. John-1 GOFFE, who came from England with his two brothers in 1662 or 1663, was admitted to "Increase Mather's Church" in 1676 or 1677. He took the usual oaths at about the same date. He m. 1678 to Hannah Sumner, daughter of William & Elizabeth (Clement) Sumner, of Boston, and d. at Boston July 24, 1716. She b. 10 June 1659 and d. between 1715 and 1720. John-2 GOFFE, Esq. (John-1) was born 18 Sep 1679, baptized 24 Sept. 1679; he died 18 Sep 1748; was commonly known as "Squire" Goff; About 1701 he m. Hannah Parish (or sometimes written Parris). She b. in Boston, MA in 1679. She was the daughter of Robert and Elizabeth Parish/Parris who had a garrison house in the south part of Dunstable (now Nashua) NH. REPORTEDLY, [see note below] her father Robert, mother and older sister were massacred by the Indians about 1691 and that the two young girls hid under a hogshead in the cellar and were saved, Hannah reportedly being one of these This story is in dispute. John & Hannah Goffe removed from Boston to Londonderry 1719. Note--The story of the massacre of Robert Parris and his wife and daughter and the miraculous escape of two little daughters by an ingenious concealment in the cellar has been given in several publications. The event is not mentioned by Penhallow or by Pike. The story of the massacre was first published, 1823, in Farmer and Moore's Collections.,[p.58] Vol. II, page 306. It has been refreshed and enlarged by Fox and Nason. The record proves that Robert Parris died in Chelsea and that his wife survived him. One of the little girls said to have been concealed in the cellar on the date of the assumed attack, was a wife and mother of several children and was safely living in Chelmsford; the other was married and living in Boston]. One of the first settlers of Derryfield [Manchester NH]. In his will, he bequeathed to his daughter Mary, 50 pounds, 5 shillings, old tenor, and one cow. To his grandson, Benjamin Litchfield, he gave one hundred acres of land in the township of Londonderry. He also gave to his grandson, John Kidder, all his right, title and interest to a fourth division in Londonderry. To a number of granddaughters Hannah Gorman and Sarah Linkfield, along with Sarah Kidder, Mary and Esther Kidder he gave forty shillings each, and the remainder of his property he left to his son John, and his grandchildren, the heirs of his daughter, Mary Wood. His son John was appointed executor. 2. Mary, b 1702/03, prob. d.y. Col. John-3 GOFFE, (John-2, John-1), b. 25 March 1701, probably in Boston MA; baptized in Second or North Church (Increase Mather's) 25 March 1701 ; died 20 October 1781; married 16 Oct 1722 in Roxbury MA [or Boston in one course] to Hannah Griggs, of Roxbury, MA, dau of Ichabod & Margaret (Bishop) Griggs; she was b. 2 Oct 1702 and d. 18 May 1798. He went with his father to Londonderry NH at an early period. He settled at the mouth of Cohos brook, the outlet of Massabesic pond at the Merrimack river, about three miles below the city of Manchester, at what is called "Moore's village." He is sometimes called "Hunter John" in old documents, as his early life was spent hunting. He was also a justice of the peace. The (current) Wayfarer Inn is located on the site of the historic John Goffe's Mill. He was granted this land as a reward for his services to the colony in the French and Indians wars. In 1746 to 1755, was a captain in service; in 1757 he served against Crown Point, as lieut. col., and in Col. Munroe's surrender, lost 80 men by massacre; in Amherst's campaign he was second to Col. Lovewell, and in 1760 led 800 provincials to Montreal under Haviland. In 1761 he was at Ticonderoga, as we learn from a letter written by him to his only son, Lieut. John Goffe. He was stationed at Fort William Henry, which surrendered to the French; eighty out of two hundred of the New Hampshire regiment were murdered by the Indians, as they marched out of the fort, unarmed, after they had capitulated. In 1768 he was Colonel of the 9th N. H. regt. (He was appointed colonel by Governor Wentworth, and held his commission as such until the Revolutionary War.) In the register of New Hampshire for 1768 we find him colonel of the ninth regiment of militia. At the time of the American Revolution, Colonel Goffe was too old to take an active part as a soldier. In 1771 when New Hampshire was divied into five counties, and the courts were re-organized, Colonel Goffe was appointed judge of probate for Hillsborough county, and retained that office until 1776. He removed to Bedford some time previous to the American revolution, and represented Bedford and Amherst in the General Court. He was a religious man. As was the custom in those days, he would conduct divine service on the Sabbath in his own house. It is said he sang and prayed, and read a selected discourge to his audience. People from Bedford and also Goffstown and possibly Merrimack and Litchfield attended that worship. He is buried in the old graveyard in Bedford NH. 8. +Marcy-4, b.12 June 1730 Londonderry NH; m. 25 Sep 1750 Manchester [Derryfield] NH to Nathaniel Martin. A Historic marker can be found on Route 3 in Bedford near the Manchester line, about .2 miles north of its junction with Route 101. This is considered the site of Squire John Goffe's log homestead on Bowman's Brook. John Goffe's Mill, now part of the motel complex across the road [see the Wayfarer link], was built in 1744 by his grandson, Major John, rebuilt in 1834 by his great grandson, Theodore, following a fire, (and the following year added new and improved mechanical devices, the most notable being an iron turbine that replaced the wooden wheel). The unsually heavy flood in the spring of 1909 caused the mill to collapes, and the mill was abandoned and the buildings on the land were leased for farming In 1939 another descendant, Dr. George Woodbury, returned to the ancestral home in Bedford NH. The site consisted of a wooded lot, a vacated house and the crumbling ruins of the old mill on Bowman's Brook. Dr. Woodbury restored the mill, operated it throughout the 1940's and 1950's turning out stone ground flour and pine furniture, specializing in a milking stool (popular as a TV chair). He wrote two books about the Goffe family and the mill. In 1962 the Dunfey brothers purchased the property and opened the Wayfarer Inn. The grist mill was incorporated into the gift shop. The Inn is now owned by Starwood Hotels & Resorts. Hannah-3 GOFFE (John-2, John-1) b 4 Feb 1705-6 [old proprietor's book], and died at Litchfield NH August 29, 1734; she m. 9 Feb 1723 in Londonderry NH to Edward Lingfield [Linkfield] by Rev. Mr. McGregor. He is called "Corp. Edward Lingfield" of Nutfield, and is listed among those joining the 'Lovewell Expedition' in April 1725 to attack the Pequawket Indians (he survived the expedition). In 1722, along with his brothers-in-law, John Goffe Jr. and Benjamin Kidder, built a house on Cohas Brook, being the first nown inhabitants of the present city of Manchester.The first tax-list in 1733 for Nottingham NH [part of "Old Dunstable"] shows the name of "Edward Lingfield." He bought, Oct 13, 1724, of Henry Wark, a tract of land in Chester [NH] which he sold January 3, 1725-26 to James Frye of Andover MA, and July 5, 1725 he bought of Benjamin Kidder another tract of land in Londonderry NH , which he sold March 30, 1727 to John Moore. Edward Linkfield died by 30 Nov 1748 -- In the Haverhill District probate book, 1748, shows guardianship of [his son] Benjamin Linkfield, minor, aged more than fourteen years, son of Edward Linkfield of Haverhill District, yeoman, deceased, granted to James Walker of Souhegan East, yeoman, Nov. 30, 1748. Then 30 Nov 1748 bond of James Walker with John Goffe, gentleman, and John McLaughlin, yeoman, as surities, all of Souhegan east... for the guardianship of Benjamin Linkfield. The administration gives the following: The account of John Goffe, administration of all and singular the goods and chattels of Edward Linkfield late of Litchfield deceased. The Estate of Edward Linkfield deceased Dr to John Goffe - 4 years boarding of his two children Sarah and Benjamin from September 1735 to September 1739 at ? ( oe 20 per year.... oe 80-0-0 ) to 2 years boarding of Benjamin from September 1739 to September 1741. 1. +Elizabeth LINKFIELD, b. abt 1723 in Bedford NH; m. abt 1743 in Bedford NH to Zachariah CUTTING, son of Jonas Cutting. 2. Sarah LINKFIELD, b. abt 1723 in Bedford NH, living in 1739; In 1748 she was mentioned as "Sarah Linkfield" in her grandfather's [John Goffe's 'of Cohass'] will to receive forty shillings along with Betty Cutting and Hannah Gorman, other granddaughters..
3. Benjamin LINKFIELD, b. abt 1734; married and had issue. He was indentured to Hon. Matthew Patten of Bedford. The indenture was surrended April 5, 1755. Subsequently he lived in Chelmsford and Lancaster, MA and in Hinsdale NH. Sarah-3 GOFFE (John-2, John-1), born at Boston MA 19 Aug 1709, bap. Second or North Church 15 Apr 1711; married at Londonderry NH to Benjamin KIDDER. Sergt. Benjamin-3 Kidder (John-2, James-1) was born at Chelmsford MA, 11 Aug 1697 and died before Louisbury, Nova Scotia, during its siege in 1746. Benjamin Kidder signed a petition dated 18 Apr 1721 for the incorporation of "Nutfield" (later Londonderry NH, and still later a part of the present city of Manchester NH). In 1722 he and his brothers-in-law, John Goffe Jr. and Edward Linkfield, erected houses on Cohas Brook, then in Nutfield, and became the first known inhabitants of Manchester. He was a landowner there from 1721 to 1729, and from 1732 to 1740. He lated removed to "Souhegan East" (later Bedford NH) where he resided until his death. His name appears on the Muster Roll of the Chelmsford MA company in 1724, and in 1725 his name appears on the list of men in Capt. Joseph Blanchard's Company at Dunstable NH. He was one of 46 men who marched from Dunstable about 16 April 1725 under the command of Capt. Lovell. At "Ossapy" he fell seriously ill, upon which the Captain halted his men and built a fortification where Benjamin Kidder was left under the care of the company doctor. The remainder continued on some forty miles, where they engaged in the Battle of the Pequawket (more commonly known as "Capt. Lovell's Fight) on 8 May 1725). In later years he again took up arms and served as soldier under General Pepperell. He fell fatally wounded in the Siege of Louisburg in 1746. He died intestate and letters of administration were granted to his brother-in-law, John Goffe Jr. 28 May 1746. 5. Benjamin KIDDER, unknown birth; d. before 8 Feb 1759. He served as a drummer in Capt. John Goffe's Company, Col. Blanchard's regiment at Crown Point in 1775 and again same company in 1756. In August 1757, while serving in Capt. Richard's Company of Col. Nathaniel Meserve's Regiment, he was captured by the French at Fort William Henry, being carried a prisoner to Canada, and after four months of suffering there, was conducted to "Rochelle in Old France" where he died. His brother John was granted administration on his estate. Hannah-4 GOFFE (Col. John-3, John-2, John-1) b. 16 Jan 1723, died in Milford NH 14 Dec 1819; married 1) Thomas Chandler of Bedford NH, son of Zachariah & Margaret (Bishop) Chandler; they were the first couple married at Bedford. He died 2 Nov 1752. She m2) Capt. Andrew Bradford. At her death she reportedly had 8 children, 63 grandchildren, 113 great-grandchildren (total 185). 1. Margaret "Peggy" CHANDLER, b. abt 1743 in Bedford NH; d. March 1812 in Chester, Windsor Co VT; m. 16 Sep 1764 to Dea. Richard WARD. He b. 9 Sep 1739 in Newton, MA. They removed from Amherst NH to Andover VT about 1793; descendants. 2. Hannah CHANDLER, b abt 1746 in Bedford NH [at age 14 makes a choice of Andrew Bradford of Amherst as her guardian, 9 April 1760); d. Aug 1826 in Montpelier VT; m. 1763 to Stephen PEABODY; had issue (Peabody) born in Amherst NH. Two of their sons, Thomas and John were doctors; a daughter, Rebecca was a surgeon doctress who m. Gen. Perley Davis and settled in Montpelier Vt. Other settled in Cambridge. 3. Sally CHANDLER, b. abt 1748 in Bedford NH; m. Enos BRADFORD; had two daughters and one son, all of whom were dead and family extinct in 1850. 4. Zachariah CHANDLER, b 28 May 1751 in Bedford NH, d. 20 Apr 1830; m. abt 1771 in Amherst NH to Miss Sarah Patten, dau of Capt. Samuel & Mary (Bell) Patten. She b. 17 March 1749, and d. 30 Nov 1842; During most of his minority he lived with relatives in Roxbury. They had two sons and one daugther: Thomas, Samuel and Sarah. Samuel was b. 28 May 1774 in Bedford NH and m. Margaret Orr. Some descendants in Detroit Michigan. 7. Andrew BRADFORD b 11 June 1763; m. 19 Dec 1785 to Lucy Parker. No children. Esther-4 GOFFE (Col. John-3, John-2, John-1) m. James Walker*, son of Andrew of Tewksbury MA. [One story states they arrived in this country when three or four years old.] In 1734 James and his brother Robert went to live with their uncle, Archibald Stark, thehn living in Londondrry NH. Here for three years they made turpentine from the pitch-pine trees growing abundantly in the forest. In the fall of 1737 they crossed the Merrimack River and built a log cabin for shelter during the winter, thus becoming the first settlers in the town of Bedford NH; James cleared up his farm, set out an orchard, built a framed house (one of the first built in the town). James was a great horseman. He resided on a farm in Bedford NH until 1783, when he moved to a small fifty acre lot in Goffstown, where he lived with his wife and daughter Charlotte, and his black servant Cato until he died in 1786 or 1787. 1. Silas WALKER, m. Hannah Griffin of Derryfield. They had ten children--William, Sally, Agnes, James, John and Silas (twins), Hannah, Susan, Samuel, Cotton and Esther. 3. Sally WALKER, m. Joseph Moor. Was killed at the raising of the Piscataquog bridge. 4. Esther WALKER, b 1754, d. 26 Jan 1841; m. Abraham MOOR(E). They had twelve children--Sally, Deborah, Esther, Olive, Margaret "Peggy", Samuel, Samatha, Mary, Joseph, Nancy, John and Achsah. 5. Jennet WALKER, m. James WALLACE and lived in Antrim NH. They had seven children--Betsy, John, James, Sally, Ira, Benjamin F., and Achsah. 6. Mary WALKER, m. William CALDWELL. They had eight children--Samuel Brooks Tabey, Charlotte, Mary, John Baker, Samuel, Phebe, Maria and Eliza (twins). 7. Charlotte WALKER; m. Dea. James NESMITH of Antrim; no children. Major John-4 GOFFE (Col. John-3, John-2, John-1) was born 16 Feb 1727; m. 17 Sep 1749 to Jemima Holden of Groton, MA, dau of Ens. Stephen & Hannah (Sawtelle) Holden. She was b. 24 Feb 1727 in Groton MA and d. 11 Sep 1818. He died 3 Feb 1813. They settled in Bedford NH on a new farm on which the lived and died. They were members of the Presbyterian church. He was a farmer by profession. On arriving of age, he was set up in business in Bedford by his father, who built the first sawmill and grain mill in the town, on a small stream (Crosby's brook) about three mile below Manchester on the opposite side of the river. He was commissioned a coroner by Gov. Benning Wentworth in 1762. He also held a commission of lieutenant in the First Company, Ninth regiment of militia as early as 1761, and perhaps earlier. In 1764 Governor Wentworth gave him a captain's commission, and in 1768 he was promoted to the rank of major.He served in the Revolution, as did several of his sons, two of whom lost their lives in the that struggle: Stephen was lost at sea, and William was killed in an engagement. Stephen's last letter is dated: Boston, Sept 4, 1777 in which he says, "I am going out in a brig from Boston for a five month's cruise," Reportedly he was never heard from again. The last letter from William was to his brother John, dated, "Fort Miller (NY) July 16, 1777," in which he writes to let him know that he had lost his captain in battle, two sergeants, and eight privates. "I do not expect to come home very soon, for we have battles almost every day." In the old graveyard in Bedford NH, there rest side by side the mortal remains of John Goffe, Esq., Col. John GOffe and Major John Goffe. At the right hand side of each of their places, lie the ashes of their wives. "Goffstown," and "Goffe's Falls," were so named for Colonel Goff. 1. +Samuel-5, b. 5 Dec 1750 Groton MA; reportedly m. Mercy Ann Vickery; he settled in Goffstown, reportedly resided there several years, then removed to Homer NY, where he d. 1 Dec 1842, aged 93. The Abstract of Graves of Revolutionary Patriots shows: Name: Samuel GOFF; Cemetery: East Homer Cem ; Location: Homer NY 36; Reference: Abstract of Graves of Revolutionary Patriots, Vol.2, p. Serial: 10094; Volume: 5. The 1840 Pensioners list of Homer NY shows: Samuel Goff age 89, living with Benjamin Goff. The 1840 Census of Homer NY shows: GOFF Benjamin; GOFF John A., and GOFF Samuel. There was a Benjamin GOFF early in Homer NY who reportedly arrived from VT.
2. +Hannah-5, b. 27 March 1753; m. Richard Hawes and settled in Maine where she lived several years and had 3 children; she returned to Bedford NH where she lived a number of years, then removed to Nashua NH where she d. 19 March 1840. 4. Susannah, b. 2 Oct 1757 at Groton MA; m. John Griffin; lived in Manchester and at age 28 was drowned in the Merrimack river with her husband 16 Dec 1785. 5. Stephen, b. 29 March 1760, engaged in privateering at the time of the Revolutionary war, and probably d. in 1777, as he was never heard of afterward. 6. William, b 6 Apr 1762, entered the Continental army and was killed at the battle of Saratoga, 19 Sep 1777. 7. +Griggs-5, b. 6 Apr 1764, d. 7 Sep 1814; m. Esther Griggs, dau of Nathan & Anna Griggs. 9. +Theodore Atkinson-5, b 25 June 1769; settled in Bedford NH on his father's farm, where he died 5 Nov 1860. 10. +Polly-5, b. 23 June 1771; m. Josiah Wallace and settled in Bedford; afterwards in Antrim NH where she lived to at least her 80th year. 11. Esther, b. 27 Nov 1773, d. in Homer NY 17 Nov 1841; m. Samuel Griggs. Samuel Griggs was b. 29 June 1776 in Pomfret CT and died 23 Oct 1855 in Ledyard, Cayuga Co NY; buried in the Presbyterian burying ground in Homer, Courtland Co NY; m. 6 Nov 1798 in Pomfret CT to Esther Goffe. She b. 27 Nov 1773; he m2) Relief --, b abt 1796 in NH. They apparently had no (surviving) children. Margaret-4 GOFFE (Col. John-3, John-2, John-1) b. 26 Nov 1733/34 in Manchester NH; m. 8 Sep 1754 in Derryfield NH to Col. John Moor, son of Major & Deborah (Butterfield) Moor. She d. abt 1776. He b. 28 Nov 1730/31 in Litchfield NH and d. abt 1809; He lived at "Cohas Brook" after Conquest of Canada, then in Bedford and Derryfield, NH, and then Norridgewock and Anson, ME. Was a farmer and miller (built first mill at Anson), and fought in the French & Indian War and then the Revolution, where he was at the battle of Bunker Hill. He was a Major during these wars, later being appointed Colonel in the Maine Militia. He m2d, Eunice Farnsworth. 1. Deborah MOOR(E), b 1755 in Derryfield NH; d. 22 July 1818 in Anson ME; married 1) Samuel Patten, and m2) John Clark and had issue. 2. Benjamin MOOR(E), b. 27 March 1758 in Derryfield [later Manchester] NH; died 14 May 1826 in Norridgewock, Somerset Co ME; a soldier he served for eight months of 1775 in his father's company under Major McClary; in charge of the Ferry across the Kennebec River [Moor's Ferry]; married in Derryfield NH 14 July 1778 to Alphia Baker. 3. Goffe MOOR, b. 4 Dec 1760 in Derryfield NH; d. 28 Sep 1850 in Madison, Somerset Co ME, buried in North Anson ME; reportedly a drummer boy who served in his father's company from April to August 1775; resided Norridgewock ME; m1) Elizabeth "Betsey" Fowler, by whom he had children, Elizabeth "Betsey", Samuel, Goffe and John White (MOORE); Goffe Moor married 2) 18 Feb 1794 in ME to Betsey Gray McKenney, by whom he had at least one child, Daniel G.
4. Margaret "Peggy" MOOR(E), b. 24 Aug 1762 in Derryfield NH, died 10 Aug 1820; m1) Samuel WALTON; m2) Luke WITHEE; had issue. 6. Abraham MOOR, b. 22 Dec 1768 in Seven Mile Brook, ME; d. 17 Apr 1844 in Abbot, Piscataquis Co ME; m. abt 1790 to Elizabeth Spaulding and had 10 children. 7. Joseph MOOR, b 14 Apr 1770; d. 1852 in Anson NH? ; m. Hannah Fling and had issue. 8. Olive MOOR, b. 20 July 1773 in Derryfield NH; d 18 March 1848 in Skowhegan ME; m. 13 July 1790 to Thomas STEWARD. He. b. 1766 in Lunenburg MA. Sarah-4 GOFFE (Col. John-3, John-2, John-1) b 26 March 1736/37 in Lyndeboro NH; m. Rev. John Rand, Esq. John Rand was b. 24 Jan 1727 in Charlestown MA, and took a degree at Harvard College in 1747; the first minister of Lyndeboro NH. He removed to Derryfield NH in 1765 ;He removed to Bedford NH immediately from Derryfield in 1778. His ministry in Lyndeborough was short (Congregational minister). He died in Bedford NH Oct 1805, age 77. His wife, Sarah, survived him about three years. They were buried in the old graveyard in the east part of the town [of Bedford NH]. 2. +Jonathan-5 RAND, twin, b. 24 June 1762, Lyndeboro NH, d. Oct 1780; m. Sarah Abbott, dau of Dea. Ephraim Abbott; resided mainly in Bedford NH and had 8 children. 3. Mille RAND, b. 5 Feb 1764 in Lyndeboro NH; m. Nathaniel GORDON; resided in Washington, N.H. and died in 1833, aged 69, a few years after the death of her husband. 4. Robert RAND, b. 13 May 1767 in Derryfield NH; m. Anna Gordon, dau of John and Mary (Campbell) Gordon of Townsend MA; settled in Bedford NH then removed to Washington NH, and then to Washington VT where he died at Swanton VT in 1814, aged 47; They had 10 children; His widow remarried 2) Joseph Bailey of Hillsborough and had 2 children. 6. Nehemiah RAND, twin, b. 22 May 1776 in Derryfield NH; married, settled in Bedford NH, then removed to Plattsburgh NY, returning after his wife's death to New Boston NH. 7. Thomas RAND, twin, b. 22 May 1776 in Derryfield NH; married, settled in West Springfield MA, 1803, where he and his wife were residing in 1850, a gospel minister for fifty-one years. Elizabeth-4 GOFFE (Col. John-3, John-2, John-1) b 17 Aug 1738/39; died abt 1833 in N. Winfield, Herkimer Co NY; m. Ebenezer Coston [Ebenezer Coston and Bishop Coston are mentioned in Matthew Patten's Diary of Bedford NH] He b. abt 1737 in N. Winfield NY and died 1831 in Herkimer Co. NY [one source states he died in 1774] The "History of Francestown NH states: "Ebenezer Coston was a Revolutionary soldier from this town in 1782 and he is known to have lived a few years on the Noah Bailey place. His father is said to have been one of the competitors for the honor of having written 'the verses on the fall of the Wilton Meeting house.' A child of Ebenezer was buried here in 1783, and another child in 1788. Bishop Coston, a brother of Ebenezer, was a Revolutionary soldier from Wilton. He is believed to have been the first settlers upon the Moses Bailey place. He was highway surveyor in this town in 1793. 1. Bishop COSTON, b. 1759 prob Francestown NH; d. 1847; m. Elizabeth Pelkin or Pelham and had issue. 6. Ebenezer COSTON b: 10 Sep 1755 or 1765 in Francestown,NH; Ebenezer Coston (1765-1814) enlisted, 1782, as a private in Captain Frye's company, 1st New Hampshire regiment, under Lieut.-Col. Henry Dearborn. He was born in Francestown, N. H.; died in Sherburne, N. Y.; Ebenezer Coston is listed on the "Revolutionary Rolls of Francestown NH. ; he m. 14 March 1783 in Francestown NH to Sarah Jane Hale. She b. 1 June 1763 in Beverly MA; Ebenezer & Sarah Jane (Hale) Coston had 2 children, Elizabeth, b. 26 June 1786 in Greenfield NH and died 17 Oct 1876 in Oshkosh, Wisconsin, who m. 12 Dec 1802 Alfred Skinner and had issue; and Alfred S., b. 5 Nov 1805 in Oneida NY. Rebecca-4 GOFFE (Col. John-3, John-2, John-1) b. 15 Dec 1741/42, d. 25 June 1823; m. Capt. Samuel Moor(e). Resided in vicinity of Manchester NH. 4. Rebecca MOOR, b. 10 July 1771; m. about 1789 to William Moore. He b. 10 Oct 1769. Removed to Bedford and settled on a farm on River Road, building a saw and grain mill. Had 12 children. Marcy-4 GOFFE (Col. John-3, John-2, John-1), b.12 June 1730 Londonderry NH; m. 25 Sep 1750 Manchester [Derryfield] NH to Nathaniel Martin. On Nov 27 1743, Nathaniel Martin signed the will of James Reid of Londonderry, [along with John Steell and William Cendinen]. This Nathaniel Martin was probably b abt 1723-25 in Amesbury MA, son of Samuel & Ruth (Silver) Martin. Nathaniel and Marcy Martin removed to Goffstown NH and Weare NH. The history of Weare NH calls him "Captain Martin." The History of Bedford NH states: "The family mostly removed to Maine, where their descendants now reside. Jesse was a minister of the gospel at Vassalborough, of the Methodist persuasion. Deborah married Patrick McLaughlin. " They had nine children, six sons and three daughters. [NOTE: Kathleen Martin has performed extensive research into this branch of the Goffe family. See her web site (click on "Home" to see her contact info, she welcomes inquiries and new info about the Martin family). 3. Nathaniel Martin, b. 1756; d. 1816; m. 8 Sep 1778 in Derryfield NH [now Manchester] Mary Griffin; had issue. 4. Ichabod Martin, b. 3 March 1759 Weare NH; d. aft 1829; served during the American Revolution when he was only 16, out of Derryfield NH. Descendants to New York State (Courtland Co). 5. Robert Martin, b. 7 Oct 1760 Weare NH, d. 28 Oct 1846; m. Mercy Pierce. She b. 23 July 1769 and d. 23 Jan 1850; had 11 children: Sally, Luther, Hannah, Timothy, Lucy, James, Belinda, Jefferson, Liberty, Sarepta, and Louise C.
6. Moses Martin, b. 4 Aug 1763 Weare, Hillsborough Co NH; d. 12 May 1850 in Pittsfield, Somerset Co, Maine. He m. at Norridgewock, Somerset Co ME to Anna Parker. She b. 27 April 1764 at Pepperell MA and d. 7 May 1845 at Pittsfield, Somerset Co ME. Children of Moses & Anna (Parker) Martin [may be more]: Betsey Martin, b. 18 July 1802 Pittsfield ME, m. Thomas Fowler; Mercy Martin, b. 26 March 1813 in Pittsfield ME, m. Asher Martin, had issue. 7. Jesse Martin, a minister at Vassalborough ME [per History of Bedford NH], b. 1774 in NH; d. 11 July 1853 in Vassalboro, Kennebec, ME; married Mary -- and had issue. 9. Deborah Martin, b. 3 Jan 1771, d. 30 Jan 1832 in Bedford, Hillsborough Co. NH. She m. 1793 in Bedford NH to Patrick McLaughlin. He b. 19 Aug 1767 in NH and d. 16 Nov 1834 in NH. They had 6 children [McLaughlin] Polly, Daniel, Hannah, Rodney, Nancy and John. [History of Bedford NH]. 10 or 11. Various other sources state there were additional children, namely Nathan and Jonathan, however I have not found enough evidence to credit them to this family. Elizabeth-4 LINKFIELD, (Hannah-3 GOFFE, John-2, John-1) b. abt 1723 in Bedford NH; m. abt 1743 in Bedford NH to Zachariah CUTTING, son of Jonas Cutting. He was born 28 May 1722, son of Jonas & Dinah (Smith) Cutting of Watertown, MA. She is mentioned in her grandfather's [John Goffe of 'Cohass] will of 1748 as "Betty Cutting." John-4 KIDDER (Sarah-3 GOFFE, John-2, John-1) b. 5 June 1736 at Bedford NH, died at Bristol, Grafton Co NH 3 Sep 1828, aged 92. He married at Bedford NH about 1762 to Jane Lynn. She b. 2 Aug 1740 and died at Bristol NH 10 Aug 1833, aged 93. In 1769 John Kidder settled in the part of Bridgewater NH (which later became Bristol) and built the first grist mill. He subsequently became a farmer. He is said to have served in the French and Indian War with his brothers, Benjamin and Joseph, from whom he was separated the the Indians. It is also said that he was a soldier in the Revolutionary War and fought at Bunker Hill, and the Battle of Bennington, statements which however appear to lack positive confirmation. 1. +Sarah-5 KIDDER, b. 16 Aug 1764; d. Feb 1840 at Bristol NH; m. 1 Sep 1786, at Bridgewater, Grafton Co NH to John CLEVELAND, son of John and Betsy (Downer) Cleveland. He b. at Canterbury CT, 13 Aug 1764, and d. at Bridgewater 6 June 1809. 6. +Hannah-5 KIDDER, b 9 May 1775; d. in Genesse Co NY; m. in 1795 at Bristol NH to JAMES FULLER, son of Nathaniel and Mary (Holland) Fuller. He b. Aug 1770, bap. "at Ipwich" 16 Sep 1770 and d. at Elba, Genesee Co NY in 1863. 8. +Betsey-5 KIDDER, b. 25 May 1781, d. 6 Oct 1817 at Hebron, Grafton Co. NH; m. 20 Dec 1803 at Bristol NH to Enoch CHENEY, son of Daniel and Elizabeth (Davis) Cheney. He b. at Newburyport MA and d. 16 Feb 1825 at Concord NH. He married 2nd, Widow Hoytt, and he married 3d, Mrs. Dunn. Samuel-5 GOFFE (Major John-4, Col. John-3, John-2, John-1) b. 5 Dec 1750 Groton MA; reportedly m. Mercy Ann Vickery; he settled in Goffstown, reportedly resided there several years, then removed to Homer NY, where he d. 1 Dec 1842, aged 93. The Abstract of Graves of Revolutionary Patriots shows: Name: Samuel GOFF; Cemetery: East Homer Cem ; Location: Homer NY 36; Reference: Abstract of Graves of Revolutionary Patriots, Vol.2, p. Serial: 10094; Volume: 5. The 1840 Pensioners list of Homer NY shows: Samuel Goff age 89, living with Benjamin Goff. The 1840 Census of Homer NY shows: GOFF Benjamin; GOFF John A., and GOFF Samuel. There was a Benjamin GOFF early in Homer NY who reportedly arrived from VT.
1. +Benjamin-6 Goff, b. 1782 Goffstown NH. 1. Jesse HAWES, b abt 1765 in Maine, d. 1808 in MA; m. Ann Pierce, had issue. 10. +Persis, b. 18 or 19 March 1799 (? 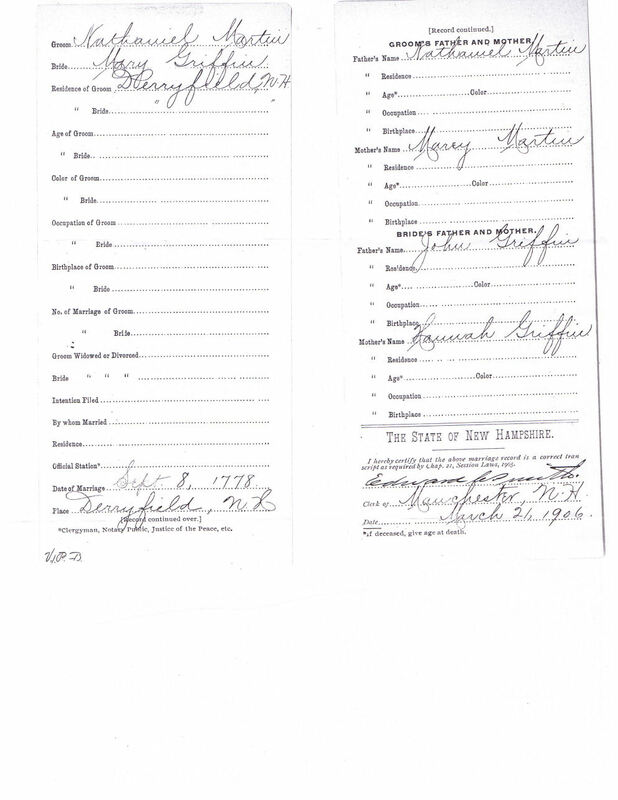 twin) in Herkimer NY; d. 17 June 1872 in Mason City, Iowa; m. 15 Dec 1822 in Herkimer NY to Samuel TYLER and had issue. 11. Hiram Slade, b. 5 Sep 1802 in Herkimer NY; d. after 1892; m1) Clara/Clarissa Adams; m2) Mary Ann Cole, attorney, in 1860, 1870 & 1880 living in Albion, Orleans Co NY with wife Clarissa, no children present in those censuses. 12. +Orange, b. 29 Nov 1805 in Winfield NY; d. 24 Feb 1878 in Mapleton, Minnesota; m. abt 1830 in Herkimer NY to Phoebe Slade. Griggs-5 GOFFE (Major John-4, Col. John-3, John-2, John-1) b. 6 Apr 1764, d. 7 Sep 1814; m. 4 April 1791 to Esther Griggs, dau of Nathan & Anna Griggs [New Haven Second Church records]; She b. 31 Jan 1767. 1. Maria, b. 10 July 1793 in Pomfret, Windham Co CT; m 4 Apr 1820 in Pomfret CT to John BOLLES and had issue. 5. Jamima/Jemima Ann, b. 23 Dec 1810, in Pomfret CT; d. 1875 in Pomfret CT; m 19 Apr 1830 in Pomfret CT to Samuel Putnam SUMNER; had issue. 6. Joseph Monroe, b 21/31 Jan 1813, Pomfret CT; d. aft 1842; possibly the John M. Goff who m. Susan (Looney) Campbell in Goliad TX in 1855. Rev. Joseph-5 GOFFE (Major John-4, Col. John-3, John-2, John-1), b. 6 Aug 1766 in Bedford NH; m. 20 Dec 1796, Elizabeth Waters of Sutton, MA, where he d. 24 Apr 1846, at the age of 79. She died 26 Jan 1839, aged 68. Worked on his father's farm, in the mills and did considerable lumber and rafting on the Merrimack River until he turned 21. He went to Windham NH and was instructed under Rev. Simeon Williams, where he studied Latin and Greek, until 1789 when he attended Dartmouth College, graduating 21 August 1791 with A.B. He taught school, and also studied with ministers in New Haven CT and Schenectady NY, and obtained a license to preach. He kept a school in Oakham, MA and where he delivered his first sermon in the pulpit 18 November 1792. Later he preached at Sutton, North Parish (Millbury MA). His ordinating was 10 Sep 1794. He was the instituting president of the Board of Commissions of Foreign Missions, and a member of the General Association of Massachusetts. 5. +Philena, b. 8 Apr 1801; May 1837 m. Silas GODDARD of Millbury MA. Had one child, Mary Elizabeth Goddard, b. 19 July 1840, died 24 May 1848. Theodore Atkinson-5 GOFFE (Major John-4, Col. John-3, John-2, John-1) was born 25 June 1769; died 5 Nov 1860 in Bedford NH; married 25 June 1798 Anne/Anna Griggs, who was b. 19 Sep 1775 and who d. 16 Sep 1859. 8. +Nathan-6, b. 27 Jan 1816, m. Mary Ann Dupee (Goza) of Kentucky and settled in Bunch's Bend, LA; physician. Polly-5 GOFFE (Major John-4, Col. John-3, John-2, John-1) b. 23 June 1771; m. Josiah Wallace, son of John and settled in Bedford NH; afterwards in Antrim NH where she lived to at least her 80th year. Jonathan-5 RAND, (Sarah-4 GOFFE, Col. John-3, John-2, John-1) twin, b. 24 June 1762, Lyndeboro NH, d. Oct 1780; m. Sarah Abbott, dau of Dea. Ephraim Abbott; resided mainly in Bedford NH and had 8 children. 1. Mille, born April 29, 1795, married Robert Parker, of Bedford N.H.
4. John Goffe-6, born Jan 27, 1801 in Bedford NH; distinguished as an artist; d. Roslyn, New York, January 21, 1873; patented the first squeezable tube, a device he has developed for keeping oil paints from becoming gummy when painting outdoors. 5. Ephraim, born Dec. 17, 1803, married Catharine Gray, Augusta, ME. 1. Jonas CUTTING, b 24 Jan 1765 at Boston MA; He married 25 April 1785, Sarah Baker, dau of Richard and Sarah (Sawyer) Baker. He died at Woodstock, Vt. 5 Aug 1834. He was Lieut. Col. 25th Infantry, and Brig. Gen. in the war of 1812. Reportely also served in Revolutionary War, though very young. Children include: Sewell (of Windsor VT), Jonas (of Weathersfield VT and Winona, MN), and there may be others. For more on this line SEE "Three hundred colonial ancestors and war service : their part in making American history from 495 to 1934 by Elizabeth M. Leach Rixford"
Sarah-5 KIDDER (John-4 KIDDER, Sarah-3 GOFFE, John-2, John-1) b. 16 Aug 1764; d. Feb 1840 at Bristol NH; m. 1 Sep 1786, at Bridgewater, Grafton Co NH to John CLEVELAND, son of John and Betsy (Downer) Cleveland. He b. at Canterbury CT, 13 Aug 1764, and d. at Bridgewater 6 June 1809. 6. Sally CLEVELAND, b. 3 Apr 1805; d. at Bath NH; m. -- Fisk. Hannah-5 KIDDER (John-4 KIDDER, Sarah-3 GOFFE, John-2, John-1) , b 9 May 1775; d. in Genesse Co NY; m. in 1795 at Bristol NH to JAMES FULLER, son of Nathaniel and Mary (Holland) Fuller. He b. Aug 1770, bap. "at Ipwich" 16 Sep 1770 and d. at Elba, Genesee Co NY in 1863. Betsey-5 KIDDER (John-4 KIDDER, Sarah-3 GOFFE, John-2, John-1), b. 25 May 1781, d. 6 Oct 1817 at Hebron, Grafton Co. NH; m. 20 Dec 1803 at Bristol NH to Enoch CHENEY, son of Daniel and Elizabeth (Davis) Cheney. He b. at Newburyport MA and d. 16 Feb 1825 at Concord NH. He married 2nd, Widow Hoytt, and he married 3d, Mrs. Dunn. 1. Elizabeth CHENEY, b. 11 Aug 1804 at Bristol NH; d. 26 Nov 1804. 5. Hannah CHENEY, b. June 1811 at Bridgewater NH; d. 17 Nov 1880 at Plymouth NH; m. at Plymouth NH to George DEARBORN. +Benjamin-6 Goff, (Samuel-5, Major John-4, Col. John-3, John-2, John-1) son of Samuel Goff, b. 1782 Goffstown NH. In 1798 (at age 16) he emigrated to New York and settled at East Homer. For a time he made his home with John Albright. He married November 1847 to Elizabeth Albright, dau of John Albright, who had served during the Revolutionary War. After her death, he married 2nd Catharine Albright. Stephen-6 GOFFE (John-5, Major John-4, Col. John-3, John-2, John-1) , b. 14 Dec 1782 in Derryfield NH; d. abt 1812 in Cherokee IA; m. about 1803-6 in Herkimer Co NY to Susanna Stanley. She b. abt 1782 in Derryfield NH and died abt 1812. Axenia-6 GOFFE (John-5, Major John-4, Col. John-3, John-2, John-1) b. 26 Aug 1784 in Derryfield NH; d. 6 June 1875; m. 18 Sep 1800 to Martin Barber. He b. 1784 in Derryfield, NH and d. abt 1810. Frederick-6 GOFFE (John-5, Major John-4, Col. John-3, John-2, John-1) b. 28 July 1787 in Derryfield NH; d. 7 Oct 1838 in Derryfield NH; m. 1815 in Locke, Cayuga, NY to Melinda Crandall. John-6 GOFFE (John-5, Major John-4, Col. John-3, John-2, John-1) b. 22 May 1790 in Derryfield (Goffe's Falls) NH; d. 11 Sep 1878 in Marcellus, Cass Co. Michigan; m. abt 1812-14 in NY to Martha Foster. She b. 1790 in Derryfield NH and d. 1820. Plainville, Adams, W OR 12 Jun 1890 in Potter County, Pennsylvania; m. Edmund Jones (1823-1891) and/or Atlas Bithon Bennett. 3. Matthew Marvin Goff b. 5 Jan 1826 in West Winfield, Herkimer, NY; d. 5 Aug 1913 at Horicon, Dodge, WI; He m. about 1850 to Harriet --. She b. abt 1824 in NY. In 1910 census Matthew and Harriet still living in Harican, Dodge Co Wisconsin. Had 4 children, among them Susan GOFF, b. abt 1860 in Wisconsin, and Waldo, b. abt 1875 in Wisconsin. 2. Ann M., b abt 1844 NY; m. bef 1870 to James HASTINGS. Orange-6 GOFF (John-5, Major John-4, Col. John-3, John-2, John-1) b. 29 Nov 1805 in Winfield NY; d. 24 Feb 1878 in Mapleton, Minnesota; m. abt 1830 in Herkimer NY to Phoebe Slade. She wa b. abt 1810 in Winfield, Herkimer NY, and died 1836. He was a teacher; In 1850 census living in Winfield, Herkimer Co NY with wife Phebe, dau Mary (15 b NY), dau Amelia A. (14 b NY), son John A. (11 b NY), son Patrick H. (8 b NY), and son Frederick (6 b NY) In 1860 living in Oak Grove, Dodge Co. Wisconsin with wife Phebe, dau Elizabeth (age 26 b St M), son Henry (age 18 b St M) and son Frederick V. (age 16 b St M);In 1870 living in Mapleton, Blue Earth County, Minnesota with wife Phebe, son Victor (age 27, teacher b NY), dau J.E. (27 b NY), dau M.E. (22 F b. Minnesota). From 1853 to 1857 Orange Goff purchased acres of land in Wisconsin; On Nov 3, 1865 Orange Goff purchased 80 acres of land in Minnesota. Ebenezer W.-6 GOFFE (Rev. Joseph-5, Major John-4, Col. John-3, John-2, John-1) b. 23 Apr 1799; m. Hannah P. French of Bedford NH. She died 13 Dec, 1847. Joseph-6 GOFFE (Rev. Joseph-5, Major John-4, Col. John-3, John-2, John-1) b. 29 Sep 1804; graduated at Amherst College, 1826; married Almira C. Hepburn of Vt in 1840. He died in Montgomery AL 13 ug 1847. Philena-6 GOFFE, (Rev. Joseph-5, Major John-4, Col. John-3, John-2, John-1) b. 8 Apr 1801; May 1837 m. Silas GODDARD of Millbury MA. John-6 GOFFE (Theodore Atkinson-5, Major John-4, Col. John-3, John-2, John-1) was born 5 May 1799; m. 31 Jan 1826, Jane Riddle, who was b. 3 Sep 1800 and d. 1875. He d. 1873. Stephen-6 GOFFE (Theodore Atkinson-5, Major John-4, Col. John-3, John-2, John-1), b. 16 March 1803; m. 22 Nov 1825 to Mary T. Cutler, and d. 24 June 1836; She was b. 26 July 1804 and d. 18 June 1894. 2. Theodore A., b. 5 Jan 1831, resided in Portland, OR, where he worked for the Oregon Railway and Navigation Co.
Nancy-6 GOFFE (Theodore Atkinson-5, Major John-4, Col. John-3, "Squire John-2, John-1) b. 1 Aug 1805, d. 16 Aug 1888; m. 20 June 1826 to John A. McGaw. H was b. 29 Jan 1801, and d. 13 July 1871. Resided in New York City. 2. +Harriet Ann McGAW, b. 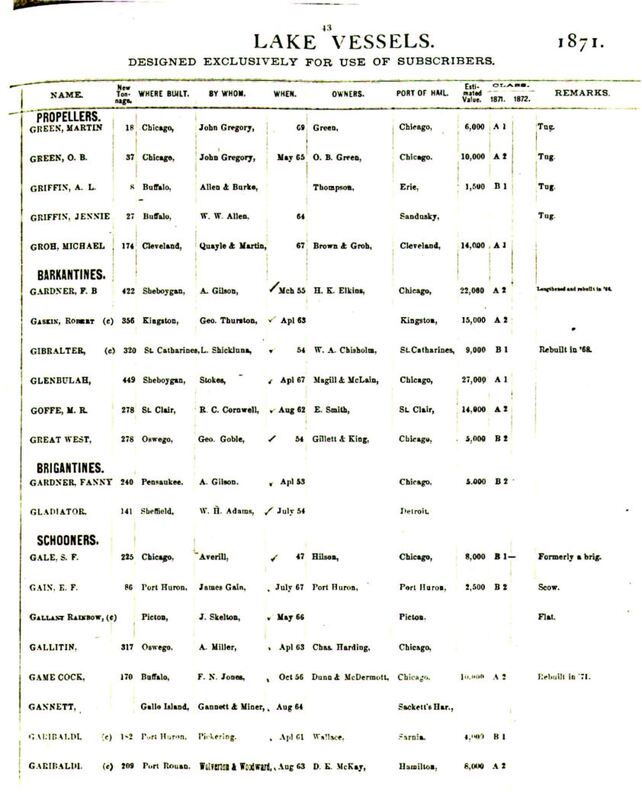 30 Jan 1832; [See this link for their descendants. Harriet was a descendant of Hon. Matthew Thornton, signer of the Declaration of Independence through her father John McGaw] m. Freeman Perkins Woodbury, 10 Nov 1856; lived in New York for many years and later lived in Bedford NH. 3. Hannah Thornton McGAW, b. 15 July 1834; m. 10 Apr 1862 to Rev. William H. Fenn; resided in Portland ME in 1880., no children at that time. 4. Helen McGAW, b. 17 March 1838 in MA; m. 13 June 1867 to Fleming Smith of NY where she resided. He was b Nov 1836 in NY. In 1880 residing in New York City. In 1900 census living in New York city with wife Helen, and brother Almon M. Census states they had no children, so probably none ever born to them. 2. +Frances Eliza ("Fannie") PARKER, b. abt 1841 NH; in 1850, 1860 and 1870 census living with parents in Bedford NH; in 1860 teacher; in 1870 age 28 single, at home. William-6 GOFFE (Theodore Atkinson-5, Major John-4, Col. John-3, John-2, John-1) b. 14 Dec 1809, d d 6 Nov 1897 at Kenosha Wisconsin, aged 88; m1) 17 march 1835 to Clarissa Laberee, who was b. 13 Dec 1807 and d. 23 Nov 1844; he m2) 8 Apr 1845 to Betsey Riddle, who was b. 9 Dec 1819. 8. Sarah Frances, b. 3 May 1853, d. Feb 1856. 3. Aurora (Ora), b. 3 Feb 1856 in LA, m. 22 Jan 1880 in Missouri to G.WILSON HACKNEY, son of Wilson & Mary (Kimbrough) Hackney and had at least 2 children. He b. in Springfield MO 29 May 1855, and was a tinner with the firm Hackney & Speaker in Springfield MO. He died 12 April 1863. John Albright-7 Goff (Benjamin-6 Goff, Samuel-5, Major John-4, Col. John-3, John-2, John-1)son of Benjamin & Elizabeth Albright, dau of John Albright, was born 30 Sep 1809 on the Albright Farm at East Homer, NY. He was reared in East Home, receiving his education there. He engaged in farming until the year 1849, when he located on another farm in the town of Homer, composed of 161 acres. That he sold and bought a smaller farm of 30 acres. He married Elizabeth Thomas, daughter of Arnold and Audrey Thomas of Willet. 2. John T. Goff, died of pneumonia at Fort Tottin in 1861, while serving in the Union Army, Co. G 76th Reg. NY Vol. Inf. Stephen Carlton-7 GOFF (Frederick-6 GOFFE, John-5, Major John-4, Col. John-3, John-2, John-1) b.22 Apr 1830 in Locke, Cayuga, NY; d. 23 Jan 1905 Cherokee, Cherokee, IA, USA; m. 29 July 1849 to Angeline Arnold; She b. August 1827 in Jefferson County, NY; and d. 1 March 1870 in Deloit, Crawford, IA. He m2) abt 1873 to Helen M. Ellis. She b. 30 Apr 1855 in Rome, Kennebec, ME and d. Death: 27 Jan 1931 in Cherokee, Cherokee Cty, IA. 3. Martha Arcana Goff b. Oct 1856 in Newburg, Cass, MI; m1) Martin E. Ericson; m2) -- Keeler. 8. Lillian A. GOFF b. 4 OCT 1875 in Cherokee, Cherokee Cty, IA; m. Burt O. Cobb. 9. Maude Berle GOFF b. 11 APR 1877 in Cherokee, Cherokee Cty, IA; m. 23 May 1893 in Cherokee, Cherokee Cty, IA to George L. Martin. 4. William "Bill" Ira Goff b. 15 Jan 1861 in Washington, IA; d. 21 Apr 1943 in Joliet, Carbon County, MT; m. Laura Olive Headington. She b. 10 feb 1872 in Decorah, Iowa. Had at least 2 children: Hazel b. 17 Apr 1893 in Nebraska, and Glady, b. Oct 1894. 5. Orlando Jackson Goff b. 6 Apr 1866 in Decorah, IA; d. 27 Sep 1945 in Joliet, MT; m. 2 Feb 1888 in Deloit, Crawford County, Iowa to Clara Laughery. She b. 4 Nov 1865 in Coal Valley, Rock Island County, Illinois. In 1920 living in Billings, Yellowstone Co. MT with wife Clara, nephew Philip Butler (age 22 b Iowa), niece Glendene Laughery (age 16 b. Montana), and mother-in-law Jane Laughery. In 1930 living in Carbondado, Carbon Co. MT with wife Clara. She b abt 1865-6 in IL. 8. Mark H. Goff M 1876-9 in Washington, IA; in 1895 living in Crawford IA; m. about 1905 to Kathryn/Katherine M.. She b. 1881 in Utah. In 1920 living in Eardwell, Jefferson Co MT, a miner; in 1930 living in Join School, Jefferson Co MT, a coal merchant. No children shown in those censuses. to Melissa "Jennie" V. Lewis. In 1910 living in Salida, Chaffee Co., CO with wife, Jennie V.
John Anthony-7 GOFF (Orange-6 GOFF, John-5 GOFFE, Major John-4, Col. John-3, John-2, John-1) b abt 1839 NY; m1) Minerva J. Miracle b. abt 1842 in Canada. He m2) Augusta --. She was married previously and had a dau Inez, b. abt 1879 in MN. 2. Althea "Elthea", b. 25 Nov 1865 in Mapleton, Blue Earth,MN [probably same child as A.M. in 1870 census]; d. 28 Jul 1907 in Hinckley,MN, buried at Chase Cemetery, Mapleton, Blue Earth, MN; m. Oliver E. Bassett; Children (BASSETT): David, John H., Eugene O., Mary A., and Earl E.
4. Jennie Aiken McALLASTER, twin, b. 23 Sep 1860 in Bedford NH; she m. 18 June 1889 to Fred A. French of Bedford NH [see French genealogy in the "History of Bedford NH]. George W.-7 GOFFE (John-6, Theodore Atkinson-5, Major John-4, Col. John-3, John-2, John-1), b. 25 July 1828; m. Elizabeth H. Tisdale. She. was b. 13 Oct 1830 and d. 28 Nov 1892; he d. 30 Aug 1895. Margaret Riddle-7 GOFFE (John-6, Theodore Atkinson-5, Major John-4, Col. John-3, John-2, John-1) b. 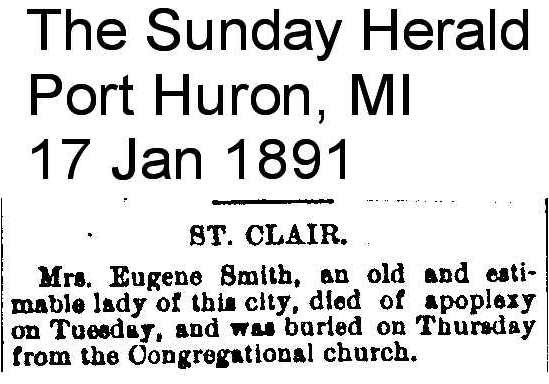 7 Feb 1833 or 1835; m. Eugene Smith of St. Clair, Michigan, d. 13 Jan 1891; In 1870 census living in St. Clair, Michigan. He b. 1822 MA, Lumberman; children Lizzie (b. 1858 Michigan) and George B. (b 1861 Michigan). In 1880 census in St. Clair, Michigan with dau Lizzie (b 1857), son George (b 1859) and son Fred (b 1871). Members Congregational Church. Margaret had a ship named for her. For more information on this line contact a descendant Steve Moore. 1. Elizabeth "Lizzie" SMITH, b. 16 May 1857 Michigan, d. 27 Jan 1939 Fernald, Oakland Co Michigan, buried Hillside Cemetery, St. Clair Michigan; m. Harry DALE 27 June 1882; he born 13 Aug 1849 in Canada, d. 12 May 1937, buried Hillside Cemetery, St. Clair Michigan; resided in Michigan; In 1900 census living in St. Clair, Michigan with wife Lizzie (b May 1857), and children Eugene Smith Dale (b 14 Oct 1884 in Michigan, d. 22 Apr 1906), Florence F. (b 8 Nov 1886 Michigan, d. 19 Dec 1975, m. Thomas Orville Moore and had sons Harry Dale Moore and Thomas Gordon Moore), Margaret Dale (b June 1888 Michigan), and Helen Dale, (b. 14 Oct 1892, d. 30 May 1893). Mary Francis-7 GOFFE (Stephen-6, Theodore Atkinson-5 Major John-4, Col. John-3, John-2, John-1) b. 10 Feb 1833; m. James M. Rollins; d. 24 March 1857. He d. 25 April 1854, age 27; their only child was James Trask Rollins, who d. 20 Jan 1854 aged 3 months and 16 days. Frances Eliza-7 McGAW (Nancy-6 GOFFE , Theodore Atkinson-5, Major John-4, Col. John-3, John-2, John-1) b. 19 Jan 1841 in MA; m. 14 Apr 1864 to Charles H. Woodbury; resided in New York. He was b. 10 March 1840 in Bedford NH, son of Peter P. & Eliza (Gordon) Woodbury. He attended the academy at New London NH, then studied law in the office of Hon. Herman Foster of Manchester; then graduated at Harvard Law school in 1861. He was admitted to the NH bar, then in 1862 went to New York City and formed the partnership of Churchill, Welch & WOodbury, from which he withdraw a few years later, and continued in practice alone. He renovated and improved the farms in Bedford on his ancestors. He attended the Presbyterian Church. In 1879 he received the honorary degree of Master of Arts from Dartmouth College. He died suddenly at Bedford NH 12 Sep 1893. In 1880 residing in NYC, no children. Charles Irving-7 PARKER (Eliza-6 GOFFE, Theodore Atkinson-5, Major John-4, Col. John-3, John-2, John-1) b. 10 March 1838 in Manchester NH; Charles I. Parker entered Dartmouth college in 1849, and was afterwards voted the honors of the class of 1863 by that college, receiving the degrees of A.B. and A.M.; in 1862 as one of the Dartmouth Cavalry company, he entered the volunteer service [during the Civil War], and on leaving the army in 1863 he settled at Virden IL, where he engaged in mercantile pursuits four years, and in 1867 taught school. In 1868 he was superintendent of schools in Carlinville IL; in Joliet IL from 1869 to 1874, and in Danville IL until 1876. From 1876 to 1881 he was principal of the Oakland high school of Hyde Park, and superitendent from 1881. He came to reside i Hyde Park in 1876. On 27 May 1862, he married Miss Frances E. Avery of Carrollton IL. Charles H.-7 GOFFE (William-6 , Theodore Atkinson-5, Major John-4, Col. John-3, John-2, John-1) b 11 June 1838; m. 21 Apr 1870, Georgianna [aka Georgie aka Georgia] Goza; she b. Dec 1850 in Louisiana, dau of Marianne & possibly George W. Goza. Her mother m2) Dr. Nathan Goff (an uncle to Charles); In 1860 living with his uncle Dr. Nathan Goff, and future wife Georgianna; In 1880 living in Springfield, Greene Co., Missouri, an accountant with wife Georgie, and children Clara, George, and Charles, and his mother-in-law. In 1900 US census living in Chicago IL, occupation, real estate. In 1910 Charles, wife Georgia and dau Clara are living in San Antonio TX. Clara age 36 is single. Charles occupation: real estate. 2. Aaron George, b. Dec 1873 in Missouri; He married bef 1904 to -- Bates; In 1910 living in 2 J-Pct, Harris, Texas, boarding with Edgar Parker. He is a widow, a college professor, with son Aaron P., age 6 (b 8 Jan1904 in Bexar Co. Texas); In 1930, Aaron [the son] is living in Chippewa Falls, Wisconsin, with wife Mary (b in Indiana) and daughter Janice (b abt 1929 in Wisconsin) [he died Aug 1966 in California]. Dr. James Riddle-7 GOFFE, Ph.B., M.D. , (William-6 , Theodore Atkinson-5, Major John-4, Col. John-3, John-2, John-1) b. 10 Aug 1851 in Kenosha, Wisconsin; m. 29 Sep/2 Oct 1890 Eleanor Taylor, dau of John Taylor, she b. June 1856 in NY; He apparently (by the census info) m2) by 1920 to Alice A. -- b abt 1865 in NY. By 1930 he was living with a niece and nephew, a widower. He apparently did not have any children by either wife. He graduated from the University of Michigan in 1873. He then engaged in teaching and for several years held the position of principal of the Public Schools of La Porte, Ind. , and removed to New York, graduating from the Bellevue Hospital Medical College in 1881. Served as an intern at the Charity Hospital and Woman's Hospital. In 1883 entered the regular practice of mediine in NY, devoted mostly to gynecology and obstetrics. He discovered a new method of removing fibroid tumors. He taught at the NY Polyclinic, where he was promoted to full professorship in 1894. He was the editor of "Medical News." a member of the NY Medical Society, the NY Obstetrical Society, and more. He was one of the original members of Troop A., New York State National Guard, in which he served for three years; and was a member of the University Club and the Richmond Country Club. He resided at No. 29 West Forty-sixth Street, New York City. Frederick/Fred-8 PATRICK (Nancy-7 GOFF, Frederick-6 GOFFE, John-5, Major John-4, Col. John-3, John-2, John-1) b abt 1859 in Michigan; m. abt 1896 to Bertha -- . She b. Aug 1875 in Michigan. In 1900 living in Marcellus, Cass Co. Michigan (see below); his mother is living with him at that time. Jerome-8 PATRICK (Nancy-7 GOFF, Frederick-6 GOFFE, John-5, Major John-4, Col. John-3, John-2, John-1) b abt 1862 in Michigan; He married about 1898 to Maggie Luella Blood. She b. June 1878 or 27 Feb 1879 in Michigan. [see census above] She was the dau of Riley W. & Eva A. (Nichols) Blood. She had 3 husbands -- 1) m 1895 to Albert Gailhouse, 2) abt 1898 to Jerome Patrick, and 3) Isaac Zerby. John F-8 Goff, (Ira A.-7 GOFF, Frederick-6 GOFFE, John-5, Major John-4, Col. John-3, John-2, John-1) b. 1855 in MI; m. 1874/75 to Mary Louisa Hunt; She b. about 1859 in Nebraska, and d. 11 October 1924;In 1910 living in Malmo Twp, Aitkin Co MN. 3. Clarence A. b 188-/81 in Iowa, d. 28 Dec 1954 in Carlton MN; married about 1901 to Cora E.. --; living with his parents in Malmo Twp, Aitkin Co. MN in 1910; in 1920 living in Malmo Twp, Aitkin Co MN with wife Cora E.
2. Lila "Lilly M." "Muzzie", b 2 DEC 1903 in Friesland, MN; d. 1966; m. Lewis LeRoy Howell. He was b. 19 JUN 1898 in Guthrie,OK. Probably had at least 9 children. Florence-8 GOFF (George W.-7, John-6, Theodore Atkinson-5, Major John-4, Col. John-3, John-2, John-1) b. 4 Sep 1854; m. Dr. Marcus E. Tully, 20 Feb 1879; resided in New York City. He b. Feb 1850, son of Dr. Marcus & Sarah (Irwin) Tully. He graduated from City College and Medical School, Bellevue Hospital, NY NY; specialized in eye, ear, and throat. Surgeon on Staff New York Eye and Ear Infirmary and Nursery and Children's Hospital. He retired in 1917 and moved to Glen Ridge NJ. He died 2 January 1929. She d. 27 Jan 1935. 1. A genealogy of the Kidder family : comprising the descendants in the male line of Ensign James Kidder, 1626-1676, or Cambridge and Billerica in the colony of Massachusetts Bay. Stafford, Morgan Hewitt,. Rutland, Vt.. Tuttle Pub. Co.. 1985. 3. Genealogical and family history of northern New York : a record of the achievements of her people in the making of a commonwealth and the founding of a nation. New York. Lewis Historical Pub. Co.. 1986. 5. History of Bedford, New-Hampshire : being statistics. Woodbury, Peter P.. Boston. Printed by A. Mudge. 1992. 6. Leslie's history of the greater New York. Van Pelt, Daniel,. New York. Arkell Pub. Co.. 1898. 8. History of Hillsborough County, New Hampshire. Philadelphia. J.W. Lewis & Co.. 1885. 10. History of Santa Barbara County, California : from its earliest settlement to the present time. Phillips, Michael James,. Chicago. S.J. Clarke Pub. Co.. 1927. 14. NEHGS Register 63:292 - "Lovewell's Men"
OTHER Goff/Goffe/Gough Family Trees (Most are different than the NH Goffe line above). I cannot vouch for the accuracy of these lines.